Bishop, February 29, 1904, in New York, by Abp. TIKHON and Bp. INNOCENT (Pustynskii), becoming the first Orthodox Christian hierarch consecrated in the New World. Now buried: Antiochian Village, Ligonier, PA; his incorrupt relics having been translated from the Arab section of Mount Olivet Cemetery, Queens, NY (which he founded) in July of 1989. Summary: Born in Beirut, Lebanon, and educated in Damascus Syria, Halki, Turkey, and Kiev, Russia, Raphael Hawaweeny found himself virtually exiled in Kazan, Russia, making himself of use on the faculty of the Anti-Muslim Missionary School, when he was summoned to the New World by the Syrian Orthodox Benevolent Committee in New York City. Immigrating in 1895 and serving under the aegis of the Russian Orthodox Mission -- then the only established Orthodox hierarchy -- he was technically pastor of St. Nicholas Church (later Cathedral) in Brooklyn, NY, but was, in fact, the roving pastor of several dozen tiny, isolated communities spread thinly across the continent. As a priest he crossed the continent repeatedly in the course of nine years, and did so several more after being consecrated Bishop of Brooklyn -- the first such Orthodox consecration in North America -- in 1905. He established a journal, al-Kalimat, to spread "the Word" to places he could not himself be, and worked diligently at translating Greek liturgical books into Arabic. These he distributed at his own expense to communities throughout the Middle East and to émigrés in the Americas, Africa, and Australasia, greatly helped preserve Orthodox Christianity in those regions. Garrett, Paul D., "The Life and Legacy of Bishop Raphael Hawaweeny," The First One Hundred Years (Englewood, NJ : Antakya Press, 1995). __________., "Envoy from Antioch: the life and ministry of Bishop Raphael Hawaweeny," Again (16.4), 6-9. __________., "Pascha, 1901," Word (28.4), 15-16. Issa, André, "The Life of the thrice blessed: Bishop Raphael Hawaweeny," Word 39.2 (Feb. 1995), 5-7; 39.3 (Mar. 1995), 9-11; 39.4 (Apr. 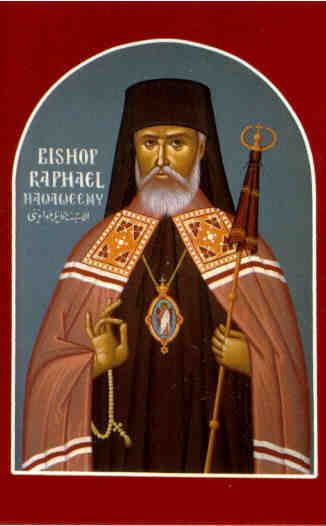 1995), 5-7 ("Bishop Raphael and Orthodox/Episcopal Relations"); 39.5 (May 1995), 9-11.